Tapas, or "small plate", dishes are great as personal appetizers or, when combined, as a varied and lighter meal. 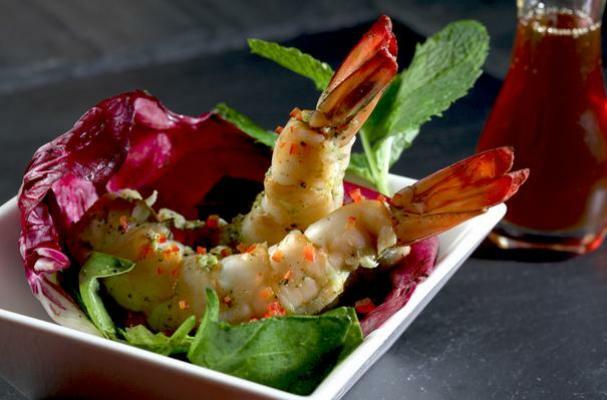 This shrimp tapas recipe dusts shrimp in a mojito cocktail seasoning atop salad greens, finished with a sweet and minty pepper dressing. It's the perfect start to any Spanish or Mexican dinner. Combine in a blender the honey, lemon juice, garlic, mint, cilantro and salt. Pulse until blended. Drizzle in the oil. Fold in the red peppers. Refrigerate. In a large pot, combine the onion, pickling spice and cilantro with 3 quarts of water. Bring to a boil. Simmer for about 10 minutes to flavor the water. Add the shrimp, cover and cook for about 3.5 minutes. Remove the shrimp with a slotted spoon and plunge them into an ice bath until they cool. Drain the shrimp. In a bowl, toss the shrimp with ½ of the dressing and in another bowl, toss the frisee with the other half of the dressing. Place the radicchio leaves on large chilled plates. Fill each leaf half way with frisee and top with 2 shrimps each.